The TS1550 POS is a cost-effective touch screen terminal ideal for retail or hospitality.Simple design, built-interface, highly reliable. The TS1550 POS is a cost-effective touch screen terminal ideal for retail or hospitality. Built in Octopus A83T, Cortex A7 2.0 GHz CPU. 8G EMMC flash, 1G DDR3 RAM. ² Android 6.01. TS1550 APK preinstalled. ² 15” TFT LCD with 1024x768, 5wire capacitive touch screen. ² 2*RS232 for RS232 device, such as RS232 printer or scale. ² 1*RJ45 for Ethernet, Built-in WIFI. 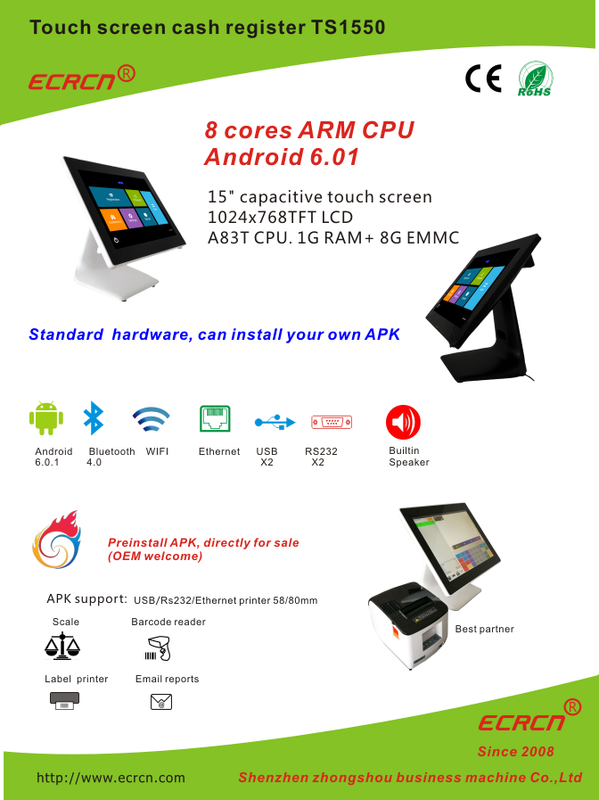 Support third party Android POS APK. APK can be customization. Have multiple applicable occasions optional: Food, Scale, Label, Retail, Milk tea, Cashing Scale, etc.